After a little hiccough with the first order - the first bike ordered was missing components from the brakes when it arrived at the shop - I collected my new bicycle, a Cannondale CAADX5 (it's a cyclocross bike), this evening and took it for a bit of a lengthy spin home. Lovely bike and I'm in for many happy hours of cycling ahead of me. So far I've put my computer and the brackets for my lights (note to self, I still need to blog about these great lights) onto the new bike. The only things still to do are put on the mudguards and move the cage from one of my other bikes. 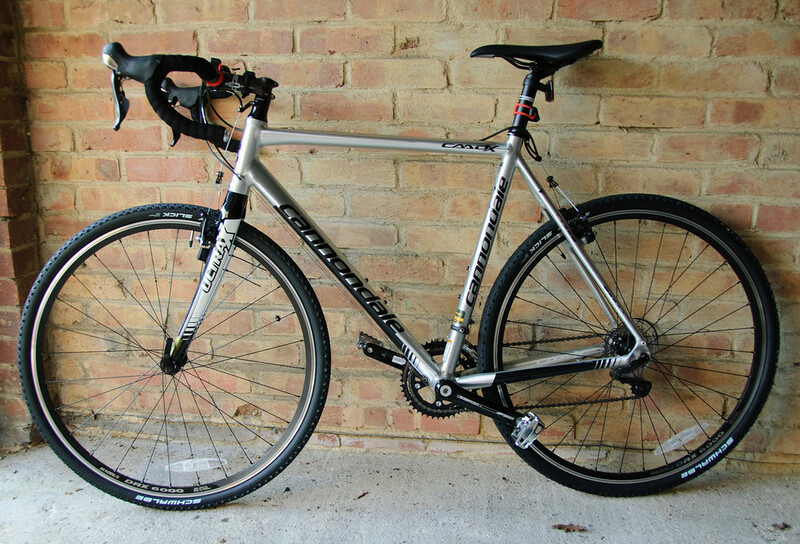 Yes, I know this is a cyclocross bike so I shouldn't be putting a cage and mudguards on it, but it's technically a bundu-bashing road bike to me, so they're kind of essential. Oh yes, if you're curious, I'm taking full advantage of the Cycle to Work scheme we get at work (I went for the full £1000) which means in the long run I'll save about 42% on the cost of this bike. Nice!! If you need (or want) a new bike you should definitely take full advantage of the various Cycle to Work schemes. You'll be able to get a nice bike and save a fortune in the long run.